Everyone has a story that contains big and small life events which shape you into who you are today. Some parts of the story are good and some are sure to be bad, just as we all experience the typical ups and downs of life. Evidence suggests that sharing your story can be powerful, especially your journey with mental wellness and recovery. The interesting thing about this journey is that it continues throughout your lifetime so you have many chapters yet to write. How will you use your story? Sharing your story, the good and the bad can help others learn and grow. And the really great thing about this process is that it also helps you to learn and grow. Each time you share where you have been and where you are going, you externalize your story. There is real value in doing this- therapeutic value. Now we wouldn't want you to share the bad parts of your story and then suffer silently so you have to decide what you are willing and able to share...what is healthy for you to share. And how much do people really need to know? "My diagnosis of Obsessive Compulsive Disorder, Generalized Anxiety Disorder and panic attacks was confirmed two years ago but I have known since I was about 16 that what I was experiencing wasn't normal. But, because of how I was socialized and the stigma surrounding mental health in the African-American community, I minimized it and didn't seek help. Mental Health America gave me an outlet and network to connect to. They have been very influential and instrumental in not only giving me the courage to share my story but to also recognize that they are just like me and everybody else; normal people living life to the best of their ability. MHA helped me expand my wine business, The Urban Taste, by securing a grant from the state of Kentucky. The self-employment program that I participated in was set up for people like me; individuals who wanted to be successful, productive citizens but needed a little help. The process actually helped me to lean on my support system. I couldn't have succeeded if I didn't recognize that and allow the good people of MHA who were just like me to help me. I was able to better manage my anxiety and panic attacks because I had people who I could talk to who would help me by offering me their kind words, sharing their experiences and checking up on me frequently to make sure I didn't retreat, withdraw and give up. I definitely couldn't have come to terms with my struggles if it weren't for them." --Read Felicia's full story, see photos and get information on her business, The Urban Taste here (PDF). Pat contacted MHA's Clinton County Compeer in 2007. While being a care giver to a man with terminal cancer, she met one of his friends... Emma. Emma was very close to him and had been helping to care for him. Pat felt, that in addition to providing medical needs assistance to this gentleman, she could provide emotional support and friendship to Emma during this difficult time. 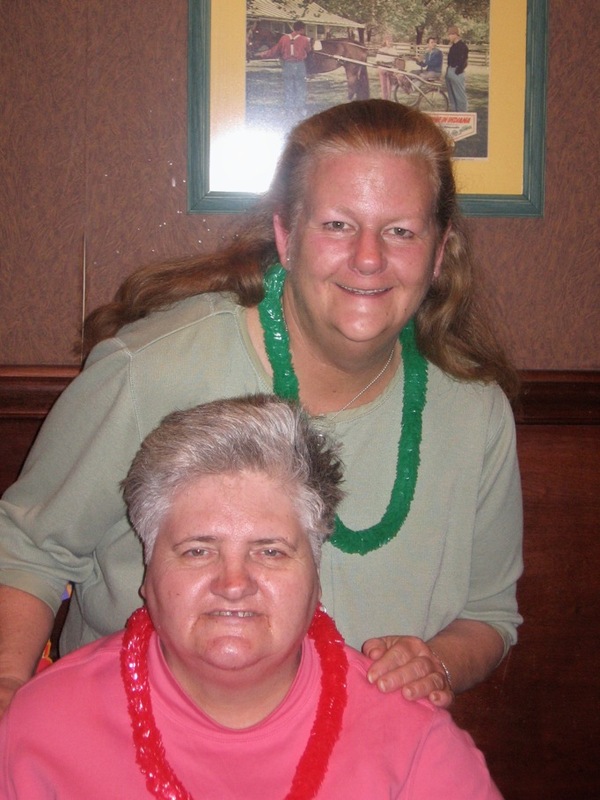 Emma and Pat were matched as Compeer friends in December 2007 and continue to be supportive of each other's needs. Last November, Emma was diagnosed with breast cancer. Pat has been by her side, many hours each day, taking care of her friend. She has taken her to doctor appointments, advocated for her and helped Emma in so many other ways. In April, Emma had a mastectomy but is now on the road to recovery! Pat would be the first to tell you that Emma blesses her as much as she blesses Emma. "Pat has a heart of gold. Compassion fills her heart and motivates everything that she does," stated Michelle Rolf, Compeer Director in Warren and Clinton Counties. This local program is very fortunate to have many volunteers, like Pat, that dedicate their time and friendship to help people with mental illness live happier, healthier, more productive lives. "It has been a while since I have last attended. Things are going very well for me. In early June I accepted a position to work at Yellowstone National Park for the summer. It has been a great experience. The weather, scenery, animal life and just the general atmosphere of the park has been so beneficial to me. I go on a lot of hikes and have met people from all over the country and from around the world. From here, in early October, I plan to go work at the Grand Canyon. I just wanted to let you know how beneficial the group was to me. The support I received got me through some very tough times. I work very hard and use a lot of what I learned from the group to keep myself in the right frame of mind. The group gave me a lot of perspective and I learned a lot about myself from attending. Thanks for all that you have done and for what you do." Email from a Depression Support Group member. He had been living at home with his parents due to his inability to work because of his depression. After attending group for about a year and accessing referrals provided, he was able to apply himself and find meaningful employment and a healthy lifestyle. A 49 year old male who had been drinking “only” beer for about 36 years, finally realized he might have a problem after getting his second DUI.Screenings indicated he did have an alcohol problem, and showed signs of Bipolar Disorder. An evaluation by North Key verified this.Dan entered Rehab for his substance use disorder at Droege, and continued to see NorthKey for mental health support. He has now graduated Droege, completed their Aftercare program, and will graduate Mental Health Court's Program in one week. He is now over 1 year sober!Unfortunately Dan lost his Mother of July 4. She did see him achieve his 1 year sober success. Another mile-marker is that even with all his grief of her loss, Dan did not take a drink. Dan has a good job, his own house, and is preparing to take our “PRIME FOR LIFE” course so he can get his drivers license back. HE IS TRULY ENJOYING RECOVERY! !.